1. Preheat the oven to 200ºC, gas mark 6. Grease 6 large (250ml) ramekins with butter then sprinkle in the breadcrumbs and roll around until the base and side are evenly coated. 2. Cook the broccoli in a large pan of boiling water for 5 minutes until tender. Drain well. 3. Meanwhile, heat the butter in a pan until melted then stir in the flour and cook for 2 minutes. Beat in the milk (don’t worry if it’s a little lumpy), bring to the boil and simmer for 2 minutes until thickened. Remove from the heat. 4. Add the broccoli to the pan then, using a handheld blender, purée the mixture until smooth. Beat in the nutmeg, cheese and egg yolks. 5. In a separate bowl, whisk the egg whites until stiff then gently fold into the broccoli mixture. 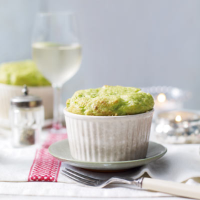 Spoon into the ramekins and bake for 15–20 minutes until risen and golden. Serve swiftly. These can be made in advance and chilled. Turn out of the ramekins onto a baking sheet and reheat until puffed up and piping hot. This recipe was first published in November 2013.